Unlike in Germany, Austrian coalition negotiations have progressed much further. The FPÖ insists on an “equal footing” in the talks, while the ÖVP wants to have everything signed, sealed and delivered before the Christmas break. EURACTIV Germany reports. One month after the election and in the middle of the coalition negotiations, the Austrians stand by their voting behaviour. Polls published at the weekend see the new People’s Party (ÖVP) stable in its election results and at the top of the party ranking. The SPÖ and the FPÖ are also unchanged in the subsequent places and, depending on the institute, recorded a result of plus/minus one percent compared to the election day. Only the Pilz List, whose top candidate had to retire due to sexual assault allegations, experienced a big drop in polls. More than half of their voters turned their back on Pilz’s party. The Greens, on the other hand, would be back in parliament with a comfortable six percent. When it comes to the future composition of the Austrian government, there is a clear two-thirds approval for an ÖVP-FPÖ coalition. By contrast, about one-third of the population is against it. And here, as was the case in 2000, resistance is forming on the left wing. Several organisations have already held or announced first protest rallies. Outgoing Chancellor Christian Kern, for whom until recently the FPÖ was an acceptable coalition partner, has now made a U-turn in view of his imminent opposition role. In interviews, he finds that “now that the [two parties] are coming together, that is a walking invitation to demonstrations”. In one of the five major negotiating chapters, the one dealing with “security, order and homeland security”, the coalition negotiations have already largely reached a consensus. Among other things, the framework for a minimum income should be restricted; benefits in kind instead of financial subsidies, recognised refugees should in the future be allowed to apply for citizenship only after ten years, like all other immigrants, and not after six. Furthermore, there is a wish to reduce the so-called illegal migration to zero and for legally convicted asylum seekers there should be no residence consolidation. FPÖ seeks not only the interior ministry but also the ministries of finance, economy and foreign affairs but such claims are considered as exaggerated. For the sensitive foreign office, an interesting candidate has emerged, the Middle East and international law expert Karin Kneissl. She was put forward by FPÖ chief Heinz-Christian Strache, who can exclude former presidential candidate Norbert Hofer from the race with this move. Kneissl was already active in the foreign ministry in the 1990s. While the FPÖ is not as keen to hurry with the negotiations, the ÖVP insist on putting an end to the talks before Christmas. This is connected to the next big election round as Lower Austria will go to the polls for its regional parliament. 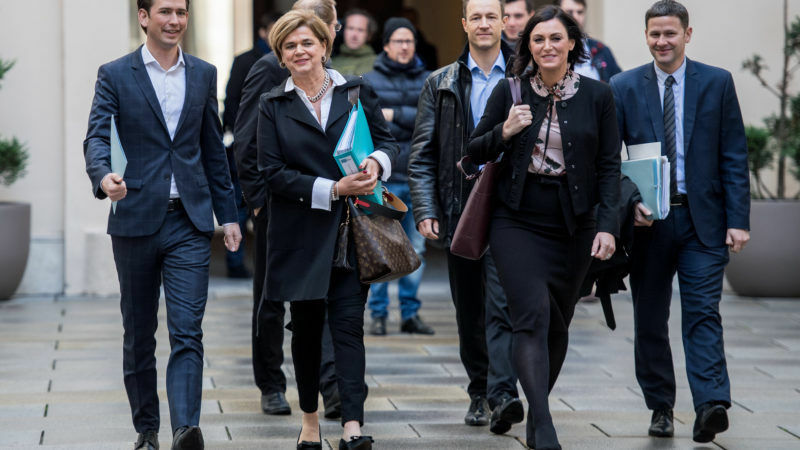 For the first time, Governor Johanna Mikl-Leitner wants to secure a strong position of the ÖVP. Therefore the aim is to ensure an election campaign (which will officially start in the new calendar year) “without outside interference”.